Drumming accompanied dance and song during the ceremonial season from December through April. Young men struck their instruments with wooden sticks while the women and older men danced. Dancers dressed in festival hats and clothing, wore masks, and carried rattles made from inflated seal stomachs. Drums, like masks, were broken after the ceremonial season or placed in caves, never to be used again. Some were left as offerings with the mummified bodies of chiefs. Mary Bourdukofsky: It’s a beautiful drum. Aron Crowell: Do you remember seeing or hearing any drums? Maria Turnpaugh: They used to have them when I was growing up. Mary Bourdukofsky: They hardly used them. They just hung like a souvenir. Maria Turnpaugh: They did at parties. Mary Bourdukofsky: Yes, once in a while they’d take it down and play it, with somebody playing guitar in the house. Aron Crowell: But not with dances or old songs? Maria Turnpaugh: Yes, in our town they did, like during Russian Christmas they did. They’d have a program, and they’d have dancing and drums. There’d be old Jenny Galuktinoff, John Goldovoff, Walter Gardayoff, and they’d dance Aleut dances. Aron Crowell: And did they have old songs? Maria Turnpaugh: Yes, they did. Mary Bourdukofsky: What kind of seal bladder is this? Daria Dirks: It says fur seal [in museum catalog record]. Mary Bourdukofsky: Fur seal bladders don’t get this big, unless it’s a very big fur seal. Daria Dirks: Not like the canvas ones nowadays. Mary Bourdukofsky: In school we were making them out of airplane material. I have one that’s made out of reindeer skin. Karen and I made it, and we used reindeer antler for the handle. Put screws through the antler and then just tied it to the stick. Mary Bourdukofsky: They always kept string there [across center]? Aron Crowell: I think it would have made a rattling noise for a snare drum. Mary Bourdukofsky: I’ve never seen a drum stick like that. Daria Dirks: It’s almost as long as the drum itself. It’s very thin too. Maria Turnpaugh: That’s a different stick than I’ve ever seen. Vlass Shabolin: It must be a strong piece of wood because look at how thin the handle is. This one is springy where you just tap on it. This backside looks like it’d fit in the palm and with two fingers you just tap it onto the drum. Mary Bourdukofsky: Maybe they used it to make different sounds for each song. Vlass Shabolin: When you tap it right at the end of the stick, you make a loud sound. If you tap it sideways, then you lay it flat and you can make a little light sound. There was a man called Ug^digdang who always had celebrations . . . . He used to say to his people, ‘Even when I am dead I shall have celebrations. So when I die, you shall lay me in the cave of my observation hill, putting with me my drum and paints. Drumming accompanied dance and song during the traditional ceremonial season, which extended from December through April. (2) Young men drummed, striking their instruments with wooden sticks, while the women and older men danced. 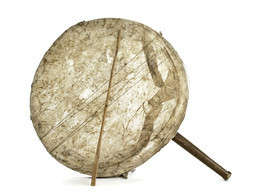 (3) Drums with handles, like this one, were the most common, although in the 1760s Tolstykh saw another type that was held by cross-cords. (4) Dancers dressed in festival hats and clothing, wore masks, and carried rattles made from inflated seal stomachs. It was reported in the 18th century that drums, like masks, were broken after the ceremonial season or placed in caves, never to be used again.